While Hawker worked on the Sea Hawk and the Hunter, Supermarine were working on their type 510. This was to be basically an Attacker with swept wings. First flight was on the 29th of December 1948. Flown by M J Lithgow, it was the first British jet aircraft with swept wings and tailplane. Powered by the large Rolls Royce Nene engine (as used in the Vampire), this meant that the fuselage of the type 510 was larger than that of the Hunter. VV106, the first type 510, underwent various carrier trials. In the process it became the first swept-wing jet to both land and take-off from an aircraft carrier (the Americans, for once, were two years behind on this score). After these trials, and with the Admiralty losing interest, modifications were made to improve the aircraft's performance at high speeds and altitudes; greater stability was badly needed. At the time, Handley Page were designing their Victor V-Bomber and decided to test their wing and tail design on a smaller aircraft. A type 510 fuselage (basically an Attacker fuselage with Swift wingroots, then designated type 521 by Supermarine) was bought from Supermarine and after a brief stay at General Aircraft, moved onto Blackburn where it was married to appropriate crescent-shaped wings and a T-tail, becoming known as the YB.2, or HP.88. Coded VX330, it actually flew too late to be of much use in the Victor programme and was lost in an accident on August 26th, 1951, killing HP pilot, Duggie Broomfield. Moving back to the Swift programme proper, the second of the real Swift ancestors was VV119, the type 528. Very soon after its first flight on the 27th of March 1950, it was modified to change the hated tailwheel undercarriage to a nosewheel arrangement (though the twin tailwheels were retained as bumpers). Other modifications were carried out; longer, pointed nose; kinked wing leading edge, larger fuselage diameter (to accommodate an afterburning tailpipe), greater fuel capacity and provision for four cannon in the wings. In this form the aircraft was known as the type 535, and this variation first flew on the 23rd of August 1950. By this time the Korean war concentrating Ministry minds on the quickest possible production of a useable fighter and the Air Ministry had become interested in a development of the Type 535 as a back-up plan for the Hunter programme, which was experiencing some difficulties and not expected to begin deliveries until 1953. Supermarine were given the contract to produce 100 suitable aircraft, to be named Swift. These were to be the Type 541, and would use Rolls Royce AJ. 65 Avon engines instead	of the less powerful Nenes used on the current slew of development projects underway at Supermarines. While the Avon, also being used in the Hunter, was amuch slimmer design than the Nene, it was considered too late to redesign the	fuselage inherited from the Type 535 (and would no doubt have proved too expensive) so the wide	fuselage remained and it was obvious from the start that the aircraft would not meet performance requirements using the relatively underpowered version of the Avon intended for the first batch of aircraft. The armament provision was changed from four cannon in the wings to two under the intakes. An RAE report on the development showed that the Swift would be a very poor performer at high altitude and some wing redesign would be necessary but despite this, the RAF were not informed and the order was even increased to a total of 150 before a prototype had even flown. 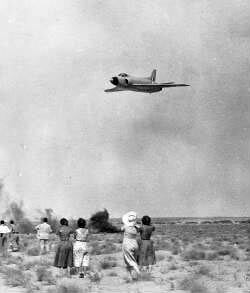 That finally happened on the 1st of August 1951, with WJ960, the first true Swift prototype, getting airborne. The second, WJ965, flew in July the next year but two forced landings caused a delay in the programme. After the DH.110 disaster at Farnborough, more modifications were carried out on the Swift prototypes and they resumed flying in February 1953, by which time another 140 aircraft had been ordered! In March that year the first production Swift F.1 finally	flew. While the first of the F.1s were in production, armament was increased	to four 30mm Aden cannon (after the Hunter had shown this to be possible), and the Swift F.2 was born. Unfortunately the extra room required for the extra ammunition was made by extending the wings forward at the fuselage join, and this caused a problem whereby the Swift could go into an abrupt pitch-up attitude, flipping onto its back in a matter of seconds. A number of fixes were made but none fully solved the problem until extra ballast was added to the nose of the aircraft. Obviously, this had the effect of making the aircraft rather less sprightly! Orders were also continuing to increase without any apparent regard for the problems being exhibited by the aircraft - indeed a US evaluation of the type in late 1952 was damning. An F.3 variant was in the process of being produced, these being reheat-capable. These, however, were destined never to be flown by the RAF, being used as instructional airframes only after trials found them unacceptable for service use. Meanwhile Supermarine continued working on a further improved variant, still battling to fix the pitch-up problem, and produced the F.4 (Type 546) as a result; the fix being a variable incidence tailplane which went some way towards curing the problem. The F.4, which had first flown in May 1953, soon made its name by breaking the world absolute speed record over Libya on 26th September 1953 with Mike Lithgow at the controls - 735 miles per hour, beating Neville Duke's record of 727 mph set using a Hunter F.3 three weeks earlier. The record only lasted a matter of days, though, before the American's Douglas Skyray pushed it up to over 753 miles per hour. 56 squadron received their first Swift F.1s on the 13th of February 1954, though the aircraft had numerous restrictions placed upon them with regards to gun firing, top speed and service ceiling. 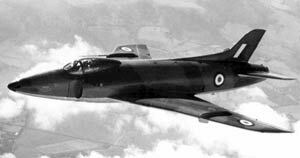 In spite of this, the Swift still holds the honour of being the first British built swept-wing jet fighter into RAF service. 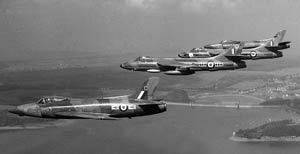 Numerous accidents resulted in the grounding of all Swifts in late August, and 56 Squadron 'ground itself to a halt'. The Central Fighter Establishment said that it was unlikely that the Swift would ever be a suitable fighter. When F.2s replaced the F.1s a few days later (30th August), the restrictions were relaxed, but two aircraft were then lost in pitch-up accidents and the Swift fleet was once again grounded. By March of 1955 the RAF had had quite enough of the Swift and the order was given to withdraw them from service. The major problem was the type was completely incapable of combat at altitudes beyond 40,000 ft - it had neither the manouevrability, endurance or reliability required. While the F.4 did not exhibit all of the problems of the earlier marks, and it must have delighted the Supermarine team to have beaten the Hawker Hunter's speed record, all was not well with the F.4. It turned out that the F.4's reheat could not be lit at high altitude, which, for an interceptor, was not a wonderful feature - and as it needed reheat to even stay straight and level at high altitude, this was a killer blow. Only nine were built, and production then switched to the FR.5 (type 549), a low-level reconaissance variant. With the RAF having decided that the Swift was a dead-end as a fighter, and with the Hunter now entering widespread servicein this role, the Swift's fortunes lay in what had been seen as a secondary role - reconnaissance. The FR.5 was fitted with a lengthened nose housing cameras and this was finally a useful aircraft, and as it operated at medium to low level, the high altitude problems did not matter. From March 1956 II(AC) Squadron (and	later 79 Squadron) operated the FR.5 in Germany. The Swift FR.5 actually did very well in the reconaissance role; in 1957 and 1959 Swifts actually won the NATO 'Royal Flush' reconaissance competition, conclusively beating off the best types other nations could offer, including the American's RF-84 Thunderflash. The punishing low-level reconaissance role proved to be no problem for the strong Swift airframe, and no fatigue problems were encountered. It even became a popular aircraft with crews, something that would have amazed the crews of earlier variants. FR.5s were eventually replaced by the Hunter FR.10. 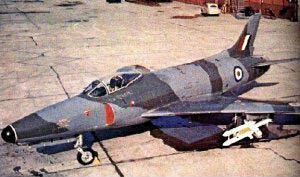 A proposed unarmed PR.6 variant (the type 550) was cancelled before production because of the reheat at altitude problems, but fourteen F.7s were built; these being equipped with radar in an extended nose cone and Blue Sky (Fairey Fireflash) beam-riding air-to-air missiles. While not used in RAF squadron service, they provided valuable information to the Guided Weapon Development squadron and were the first RAF fighters to employ AAMs. Often regarded as an abysmal failure, the Swift programme was from the start hampered by the problems of changing the engine from Nene to Avon and the lack of time to develop the aircraft along with poor communication between the RAF, government and the manufacturers. It was, after all, only ever intended as back-up in case the Hunter programme failed and despite the Hunter's early problems these had all been overcome with the introduction of the Hunter F.6. With the end of the Korean war, the urgent need for large numbers of fighters also evaporated and the amount of money needed to fix the Swift's problems could not be justified in the face of the ever-increasing success of the Hawker Hunter. 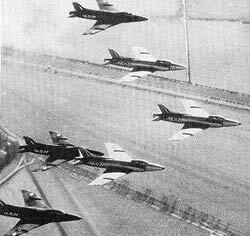 *Some F.4s appeared to have higher fins than others; does anybody have any further information on this?